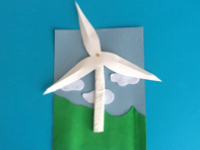 As a group, create a huge wind park! 1. Gather your material. 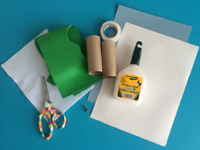 You will need a scrap of white felt, a scrap of green Fun Foam, white and blue construction paper, two empty toilet paper rolls, white electrical tape, a hole-punch (not shown), a fastener, hot glue and/or white glue, and scissors. 2. 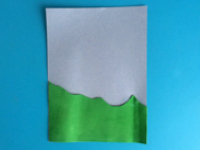 Cut the green Fun Foam to represent rolling hills. Glue them at the bottom of your sheet of blue construction paper. 3. 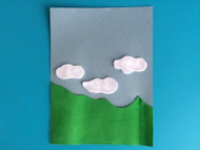 Cut cloud shapes out of the white felt and glue them just above the rolling hills. 4. 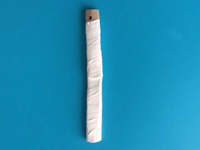 Flatten and roll up both empty toilet paper rolls as shown. 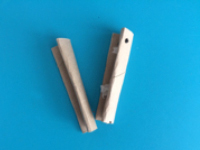 Use a hole-punch to make a hole at the top of one of the toilet paper rolls, making sure the hole-punch goes through all the layers of cardboard. 5. Position both flattened toilet paper rolls one above the other (with the one with the holes at the top) and wrap them with the electrical tape to create a long mast. 6. 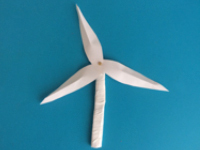 Cut three wind turbine blades out of the white construction paper. 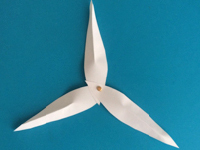 Fold each one slightly as shown and use the hole-punch to make a hole at one end of each blade. Place them one on top of the other, lining up the holes, and insert the fastener in the centre. 7. Insert the fastener in the hole at the top of the mast. 8. Glue your wind turbine on the scene, making sure the blades are above the clouds to represent the impressive size of wind turbines.